Physical Description Oshesaon is of middling height and build. His hair is well kept and always combed back. He has a strong face with piercing eyes. 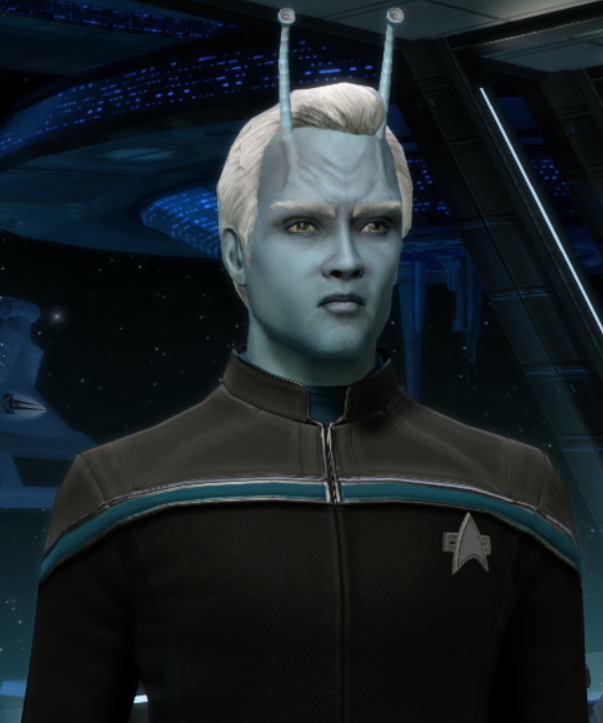 Like all Andorians two antennae sprout form his head. General Overview Oshesaon knew from a very young age that he wanted to be a Biologist, the complexity and variation between different life forms fascinated him. He was always neat and meticulous, knowing exactly where everything was. Personal History Oshesaon was born on a federation colony called Galen IV. He had many friends while growing up, from many different species. He was always fascinated by the diversity that could been seen between two different aliens. Oshesaon did very well in school, excelling in maths and science. In 2378 he started further education at Starfleet academy. In his first week at the academy he met a young Andorian Zhen called Piraash. They quickly became good friends, and had many classes together. When they graduated in 2382 Oshesaon and Piraash were assigned to different vessels, but promised each other that they would keep in touch. Oshesaon was assigned to the USS Sphinx, a Nova class survey vessel and he quietly spent his time running various experiments. In 2384 he was promoted to Lieutenant JG and given more freedom to pursue his own work. Early in 2385 Oshesaon was transferred to the USS Amazon. Upon reporting in aboard the USS Amazon Oshesaon was surprised to find out that Piraash had been transferred too, their recent contacts had been sporadic, and neither knew that the other was being transferred. They became fast friends again and their relationship quickly became romantic. The four Andorians lived happily on the Tangaroa. In late 2393 Oshesaon was made a full Lieutenant. Early in 2394 the entire bondgroup was assigned to Langley station.